Army ant (or legionary ant or "Marabunta") means over 200 ant species. 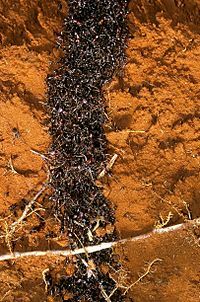 They are called army ants due to their aggressive predatory groups looking for food, known as "raids", in which many ants look for food at the same time in one place, attacking other animals en masse. Most ant species make homes where they always live. Army ants do not. They keep moving. All army ant species are members of the ant family, Formicidae,[source?] but there are several kinds that have evolved on their own the same behavior. This is called "legionary behavior", and is convergent evolution. Before, "army ant" meant ants from 5 different ant subfamilies: in two of these subfamilies, the Ponerinae and Myrmicinae, it is only a few species that show legionary behavior; in the other three subfamilies, Ecitoninae, Dorylinae, and Leptanillinae, all of the species are legionary. Now, another subfamily Leptanilloidinae, is called army ants. A 2003 study of thirty species (by Sean Brady of Cornell University) shows that the ecitonine and doryline army ants evolved from one group in the mid-Cretaceous period in Gondwana, and so the two subfamilies are now one called Ecitoninae, but not everyone says this. ↑ Dawkins, Richard (2000) . "4. Making tracks through animal space". The blind watchmaker. Penguin books. p. 132. ISBN 0-140-29122-9. [evolutionary] convergences [...] wandering in enormous pillaging armies. This is called the legionary habit. ↑ Whitehouse, David (2003-05-10). "Ant history revealed". BBC News. Retrieved 2009-01-14. scientists postulated that they evolved many times after the break-up and dispersal of the supercontinent Gondwana just over 100 million years ago. The conventional view of the evolution of army ants needs a revision because of new data obtained by Sean Brady, a Cornell University, US, entomologist who has discovered that these ants evolved from a common ancestor. BBC News, Dr. David Whitehouse, "Ant history revealed" 10 May 2003. ↑ Engel, Michael S.; David A. Grimaldi (2005). "Primitive new ants in Cretaceous amber from Myanmar, New Jersey, and Canada (Hymenoptera: Formicidae)". American Museum novitates (New York, NY: American Museum of Natural History) 3485: 1–24. doi:10.1206/0003-0082(2005)485[0001:PNAICA]2.0.CO;2. http://hdl.handle.net/2246/5676. Retrieved 2009-01-14. Brady, S. (2003). Evolution of the army ant syndrome: the origin and long-term evolutionary stasis of a complex of behavioral and reproductive adaptations. PNAS 100(11): 6575-6579. Army Ants Plug Potholes, March 2009.